Download Love, Gilda in Digital HD from the iTunes store. Love, Gilda images are © Magnolia Pictures. All Rights Reserved. Gilda Radner was born in Detroit Michigan in 1946. She lost her father to a brain tumor when she was 14 and dropped out of college to follow her boyfriend at the time to Canada. There she became part of an acting troupe and eventually joined The Second City comedy troupe. In 1974 she was part of the National Lampoon's Radio Hour alongside Chevy Chase, Bill Murray, and John Belushi. A year later she was the first person hired for a variety sketch show on NBC called Saturday Night Live and the rest, as they say, is history. Gilda Radner captured the audience and kept them laughing. 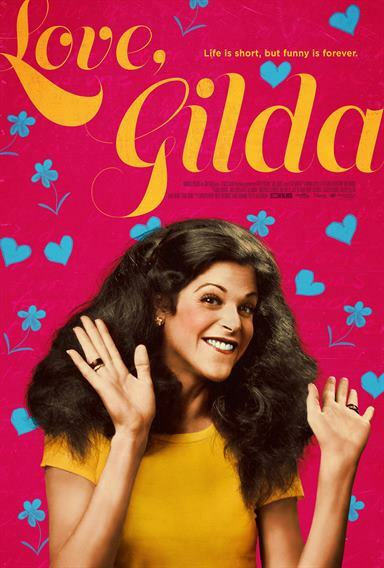 Love, Gilda - the most recent documentary about Radner directed by Lisa D'Apolito (Goodfellas) - tells Radner's story through her own words. Utilizing her own writings as well as recently discovered audiotapes the film gives the audience an intimate, behind the scenes view into the life of a brilliant comedian. It takes us on a ride from start to finish giving us insights into her life that perhaps we didn't want to really know. Like so many who make living making other people laugh, Radner was tortured with a number of demons, prevalently an eating disorder. The film begins with recent SNL alums and comedians reading her personal papers with a short of reverence reserved for historical figures. It then cuts to home movies of her as an overweight child and her own voice describing how she emotionally ate and was put on diet pills by the age of 10. Her father's death and the impact that it had on her is kind of glossed over as the film movies on to her years in Canada. The movie intersperses her audio and video clips with interviews with family and friends while trying to stature to her words. Of course, ample time is spent on her time at Saturday Night Live and her brilliance as a sketch comedian. The stroll down memory lane highlights her amazing ability to draw an audience in and make them fall in love with her (all over again if you were alive for her 1975 SNL season). Next, the movie discusses her one-woman show and showcases her loneliness - again in her own words - while being adored by millions. The juxtaposition is fascinating but not surprising as we as a society have come to learn that many of the funniest people around are really depressed. Finally, D'Apolito gets to the third act where Radner meets Wilder and discover she has cancer. While she adds a dimension by discussing, through Radner, her miscarriage and early illness, much of what is presented is what people already knew. She offers additional insight though through Wilder's nephew who knew them both well and through Radner's family and friends who recounted Gilda's struggles. The haunting home videos are images that stay with the audience though as we can see her getting sicker and sicker before her ultimate passing. At 88 minutes long Love, Gilda misses a certain amount of depth and hastily brushes past some of the aspects of her life that probably made Gilda who she was. For example, there isn't much discussion regarding how Gilda handled her father's illness and death though one gets the sense from the film that she absolutely adored him. It also discusses some aspects of her time in Toronto but jumps quickly through others, never offering the audience a complete picture. Having said that though it showcases her talent and reminds us all why we fell in love with her in the first place. It will make one want to google her old skits and search for a copy of her autobiography, It's Always Something.